Happy Monday! Today I was going to share with you a lunch date the hubby and I had with our bestie Jerry at Señor Veggie, a new vegan restaurant in San Antonio. Unfortunately those photos were somehow lost, so instead I’ll be sharing Cinnamon Sugar Soft Pretzels I made for our friend Karl when he came to visit last week. (Sorry Jerry, I guess we’ll just have to meet you there for lunch again this week!) We’ve been getting together with our friend Karl to play music the first Sunday of each month since February. It’s been fun to learn new songs and it gives me a chance to bake something delicious to share. The hubby and I had eaten all our Chinese Challah Bread, so I decided to modify the recipe I used for Mini Soft Pretzels to make Cinnamon Sugar Soft Pretzels. Combine 1 cup warm water, 1/2 tbsp sugar, and 2 1/4 tsp yeast in a stand mixer. Allow the mixture to proof for 10 minutes. You’re looking for a bubbly foam to start forming on the surface. Then add 1/4 cup flour mix on low-speed until combined. Add 1 tsp salt and remaining 2 cups of flour and mix until combined. Beat the mixture on a low-speed for a couple of minutes until the dough begins to pull away from sides of the bowl. Empty the bowl onto well-floured surface and knead by hand until smooth, about 5 minutes. Add 1 tsp canola oil to a large, clean bowl. Place the dough in the bowl and roll it around so it’s evenly coated. Cover the bowl with a damp tea towel and allow the dough to rise for 1 1/2 hours, or until doubled in size. When the dough is just about ready, preheat your oven to 450°F. Prepare two baking sheets with parchment paper, slightly greased with canola oil. Punch down the dough, take it out of the bowl, and knead it briefly. Divide the dough into 16 equal parts. Roll each piece of dough into an 18 inch long strand. Twist the dough into pretzel shape and place them on the prepared baking sheet. (Watch this video to learn how to shape pretzels) Once you’ve made all 16 mini pretzels, cover each sheet with a kitchen towel and let the pretzels rest for 15 minutes. Meanwhile, fill a large shallow pot with water and bring to boil. Add baking soda and remaining 1/2 tbsp sugar to the boiling water. Reduce to simmer and transfer 3-4 pretzels to the boiling water at a time. Poach the pretzels for 1 minute on each side, using a slotted spoon to turn and transfer the pretzels back to baking sheet. Once all the pretzels are poached use a silicon pastry brush to spread the melted butter on top of each pretzel. In a small bowl mix together the 1/2 cup sugar and 2 tbsp cinnamon sugar. Place each pretzel top down into the cinnamon sugar and rub thoroughly with the mixture. Return them to the baking sheets and bake for 12 to 15 minutes until golden brown. Let cool on wire rack and before serving. We drizzled Sohgave Honey Flavor Agave on top of our pretzels. Enjoy! · I just found out about Earth Burger, San Antonio first Vegetarian Fast Food Restaurant! They are coming soon, visit their Facebook page to learn more! 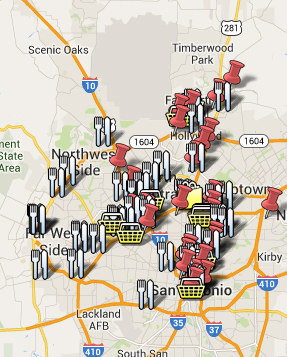 · I’ve been updating my Vegan Map of San Antonio, let me know if you have any suggestions! · Check out San Antonio Vegetable Eaters (SAVE), a supportive community for vegan, vegetarian, and veg-curious folks in the Alamo City!